It’s about time I update this blog, this time with a more interesting post! I purchased a ton of parts for the Volvo and upgraded both the suspension and the brakes all around. I decided to do them both in one shot, one of those “while I’m in there” situations. First thing I did was put the car in the air. You can see here a little teaser to my headlight and corner light repair project I have to cover in the future. Wheel coming off. Here you can see my slightly sketchy spacer setup so the meaty Neogen’s would clear the strut cartridge. As you can see the rotors are toast, but I’m going to cover that in a little more detail later in the post. First things first, gotta make it to the strut. The hardest part about changing the struts in the old “Redblock" Volvo’s is actually removing the strut from the housing. Removing the assembly is pretty straight forward. First I had to loosen the two bolts holding the caliper to the hub, which on a Upstate NY car required some leverage. Then since I was doing the brake pads while I was here, I loosened the caliper slide bolts as well. The bolts that hold the strut assembly to the hub are actually located below the strut. I loosened them next. 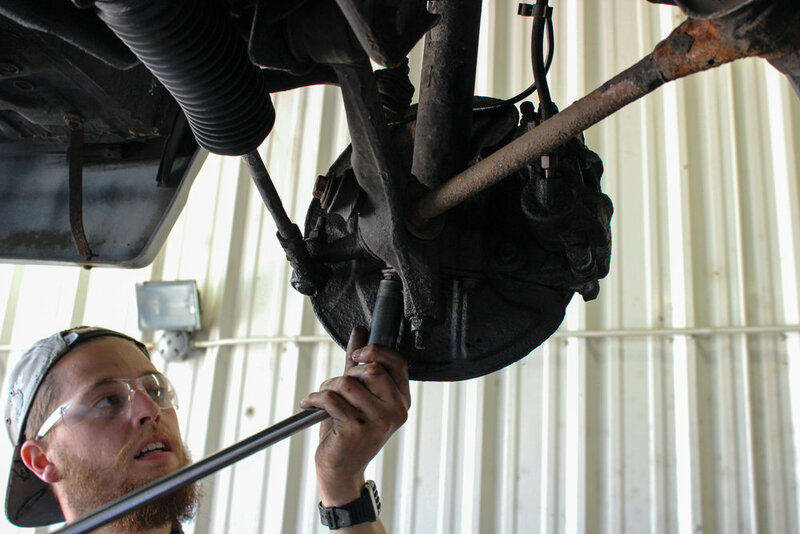 The last things you have to loosen underneath the car are the tie-rod and the sway bar link. If you are doing this to your own crusty Volvo, I recommend replacing the sway bar end link bushings, as my were shot. Next you have to remove the ABS Sensor (if your car has one) this was a common feature for 740’s this old. Unfortunately I ended up breaking both the sensors as they were essentially rusted into the hub. Removing the bolts was no problem as I had soaked all the suspension components in PB Blaster the week before I tackled this job, the sensor itself however was stuck. Now it was time to remove the braking components. First the caliper, followed by the caliper bracket, and finally the rotor. All surprisingly removed with minimal fight. Notice all the corrosion on the dust shield, this was the cleaner side. You can also see the tone ring that the abs sensor reads from, make sure you clean this off before you install a new sensor if you have one. Now it’s time for all those bolts we loosened early to come off. Since the spring is coming out with the assembly, that doesn’t leave much for you to hang your brake caliper from, so I gently placed it on this lower control arm(?) to keep from stressing the brake lines. The only thing holding the entire strut/hub assembly to the car are two top hat bolts. Before going any farther I'd recommend marking the placement of the nut on the shock tower with a paint pen, this will help keep your alignment close until you can get it re aligned. Get ready with your pry bar, because it’s going to require a little persuasion. I chose to disconnect the hub from the ball joint and leave it in the lower arm so I didn’t damage the boot. 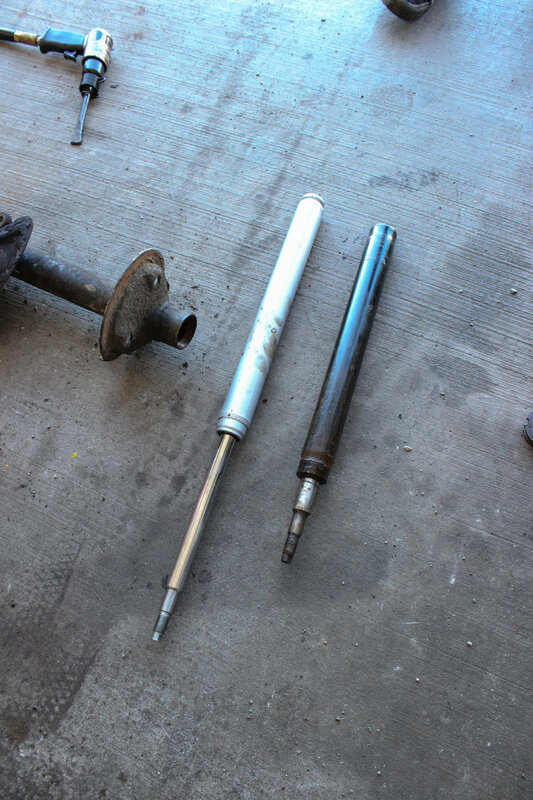 The next step is removing the spring from the strut assembly. Please use a spring compressor for this. They are essentially free to rent from any of your local auto parts stores and prevent you from breaking ribs when you decide to gun-off the top nut and the top-hat shoots into your chest. Here you an see the top hat removed, and all my ribs and appendages intact. Also notice the shredded boot and bump stop, one thing I wish I would have bought replacements for before I did this job. Next comes the hardest part of the job, removing the retainer nut at the top of the strut housing. This is notoriously seized on cars that haven’t been as salt worn as this car. Yikes. One thing I have learned is heat and penetrant are your friends. So I soaked the nut down in PB Blaster (zing) like the rest of the suspension and then hit the tube surrounding the nut with some heat from a torch. Now be careful when doing this, as you can see from the photo my struts are dead and have no compression left, but this is a gas filled tube, which you do not want to heat and explode. I have read of other methods for doing this, but the only one that worked for me was an air hammer. Line the hammer up with one of the slots in the lock nut and slowly hammer it off. 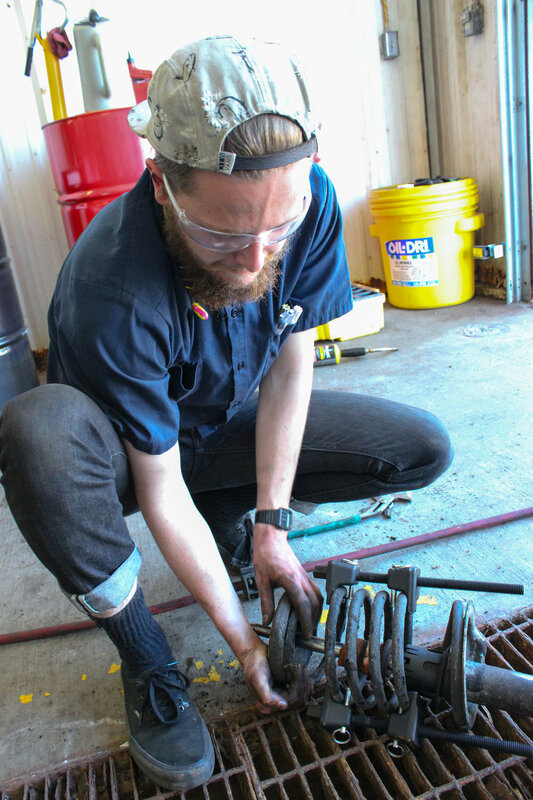 If you damaged the lock nut, don’t worry as the new struts should come with replacements. Now pull that sucker out and bask in the new and improved. Assembly is reverse of removal. A little bit of thread sealant goes a long way with this, in my opinion thread sealant is better than rust and corrosion. Hopefully you left the spring compressed as it will now slide on easily. Install the top hat finger tight and release the compressor, slowly and evenly going between both sides. 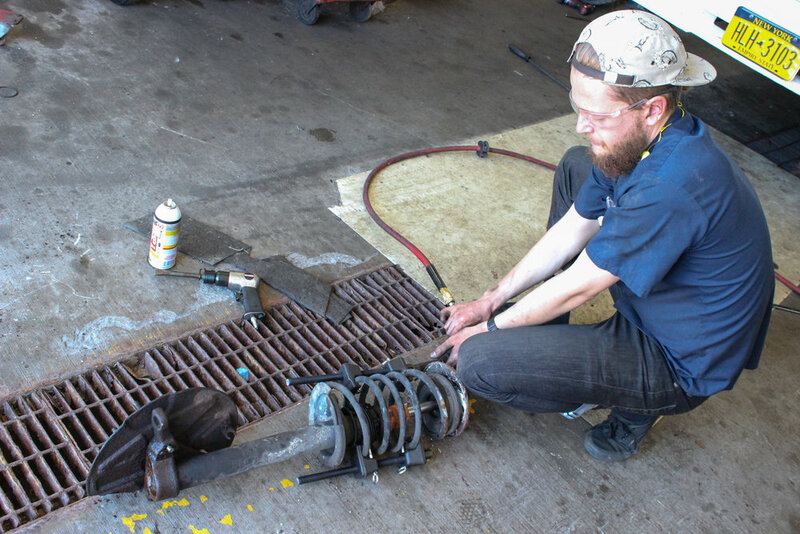 Also make sure the spring seats in the groove Volvo provides in the lower mount. Then install it back into the car. Reinstalling the brakes is fairly simple. I was having braking issues with the car so I decided to revamp as much as I could in hopes of improving this situation. 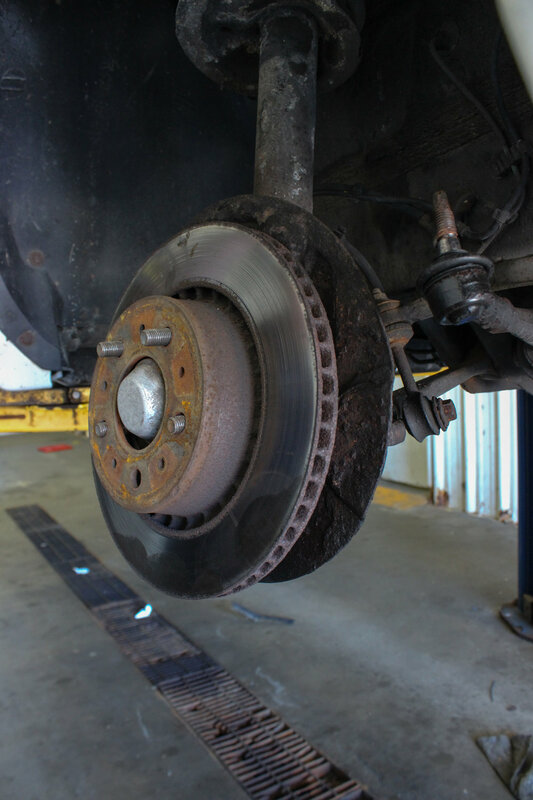 If you have the money to spend, don’t waste your time, replace the calipers and bleed the brakes. I didn’t have the funds to go this far so I decided to dress them up and hope for the best. 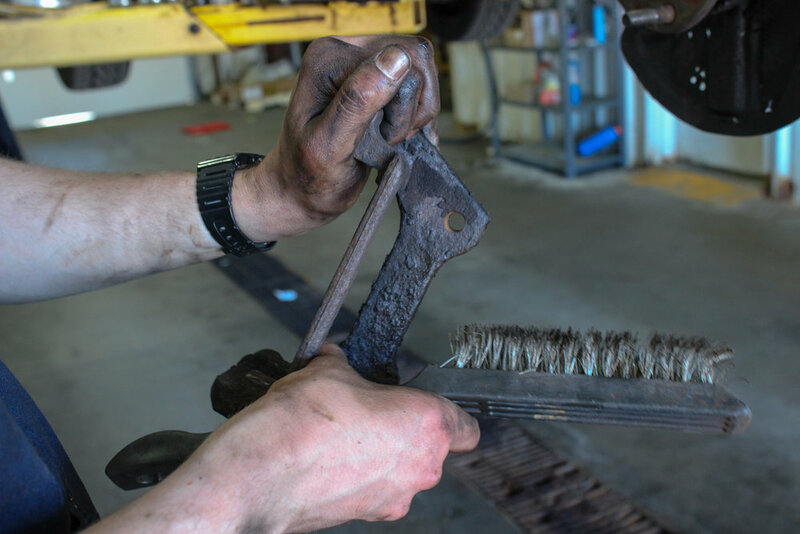 First grab a wire brush and clean up your crusty old Volvo parts. Now take your new slide pins and lube them up real good and install them into your caliper bracket with new boots that will slip and slide all over your now lubed up fingers. 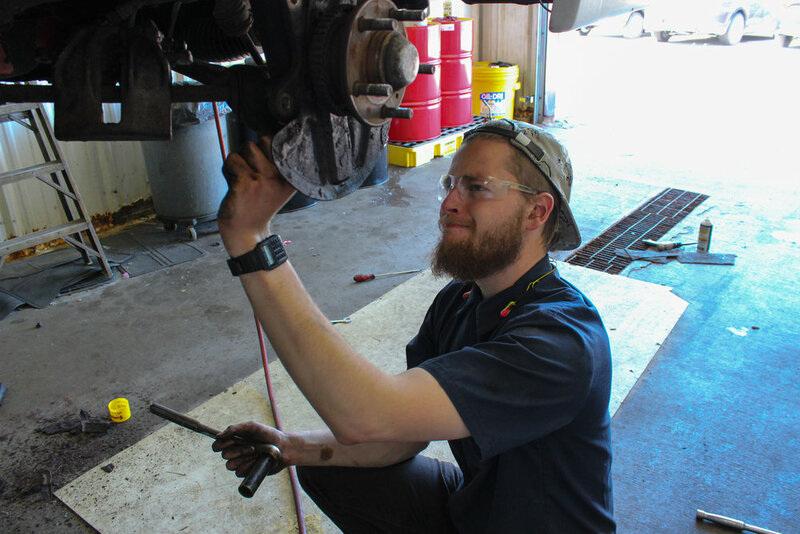 This will assure your caliper does not seize up and prematurely or unevenly wear your new brake pads. Here is an important tip if you are trying to save a buck or two. 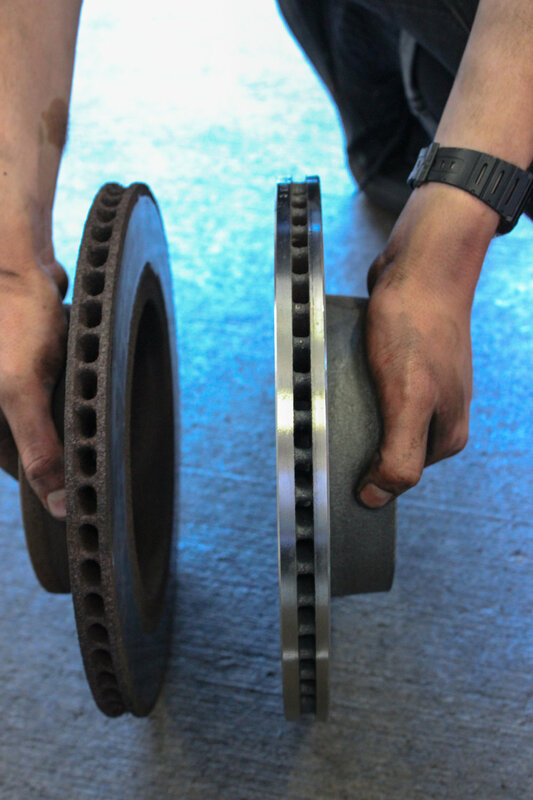 When getting your brake rotors resurfaced make sure they are within spec to be resurfaced, and here is why. You can really see just how much meat from this rotor was gone, and while I’m sure some of it is from brake wear, most of it is from a shop resurfacing a rotor that needed to be replaced. Your brakes will not operate in their effective range and your rotors will be too thin to dissipate heat properly and will warp. These are not good things on an old heavy car like this. Now wipe down your shiny new rotor and install it with the retaining screw that comes with the car. Reattach your fancy shmancy revamped caliper brackets with some thread locked bolts. 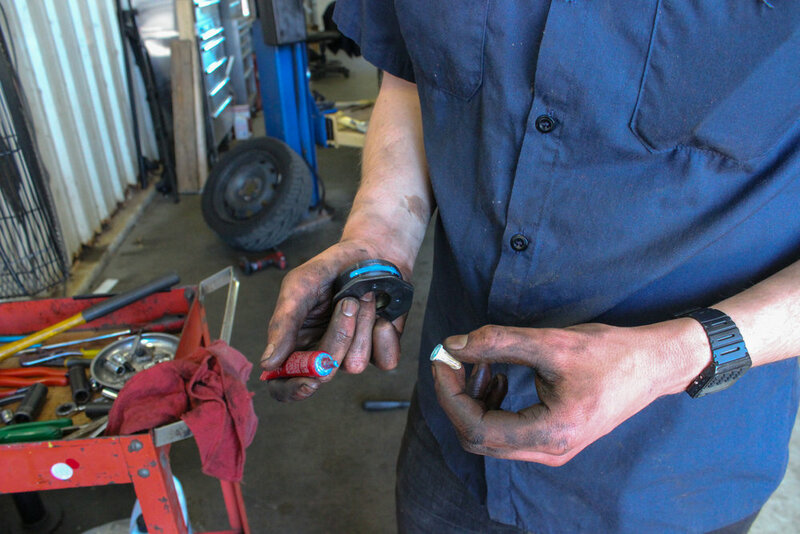 Just like the rotors, it’s time for a little brake pad compare and contrast. Notice how the old pads had a ton of material left but both of them were unevenly worn and heavily glazed over. This could have been caused by a couple of things, and was definitely not helping with braking or brake noise. 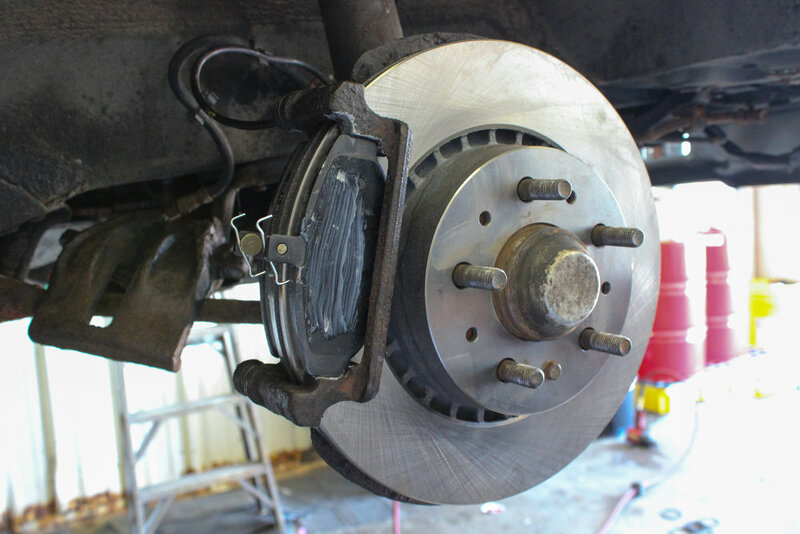 Personally I add anti seize to the parts of the caliper bracket where the brake pad makes contact, and also add brake lubricant to the shims on the back of the pad to help prevent brake noise and add to smooth operation. DO NOT GET THIS ON THE ROTOR OR PAD SURFACE. If you do spray it with brake cleaner and start again. At this point I was running out of time so I quickly compressed the caliper with an old brake pad and a c-clamp and reinstalled the caliper. That’s it, you’re done! New brakes and shocks added much more comfort to both the ride and my conscience on the cars driving ability. 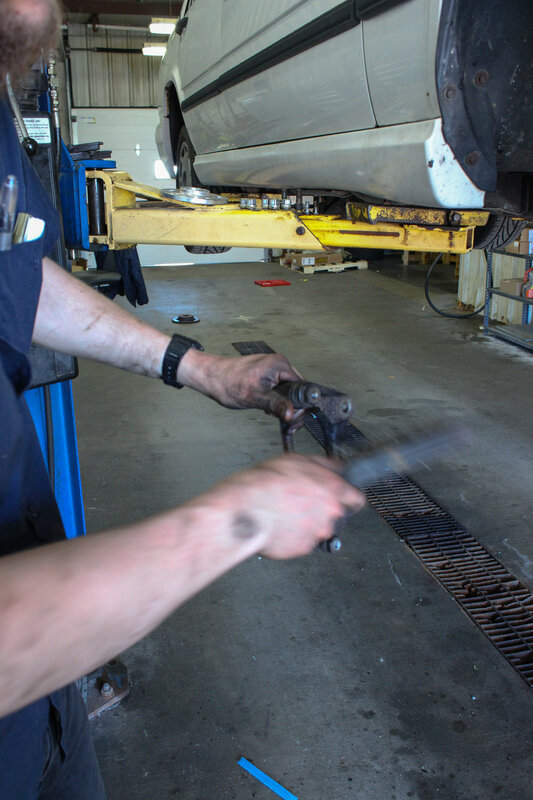 Replacing shocks is a lot of work but is very doable for the shade tree mechanic and can save you a lot of money in labor on repairs. 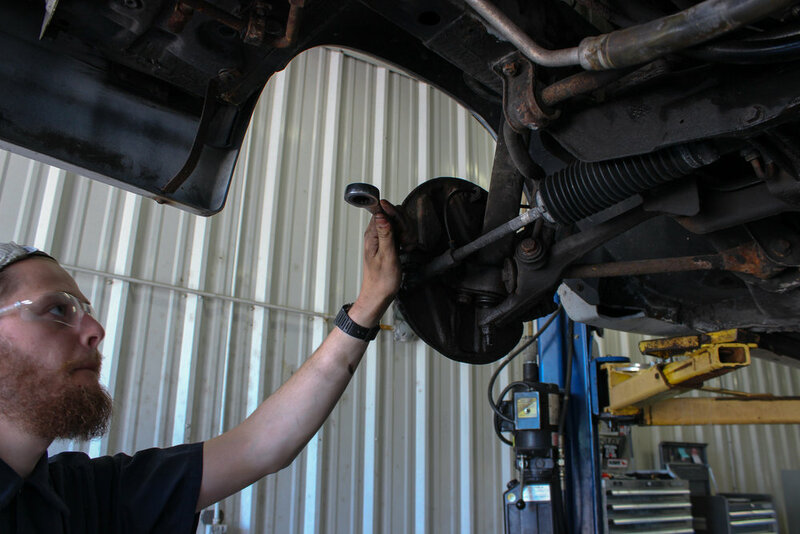 Make sure you tighten the nut that secures the strut to the top hat once the car is lowered and pump the brakes before you drive away. Next up I’ll be doing a quick tutorial on head light restoration. It made a huge difference in the Volvo’s night driving ability and cost almost nothing.